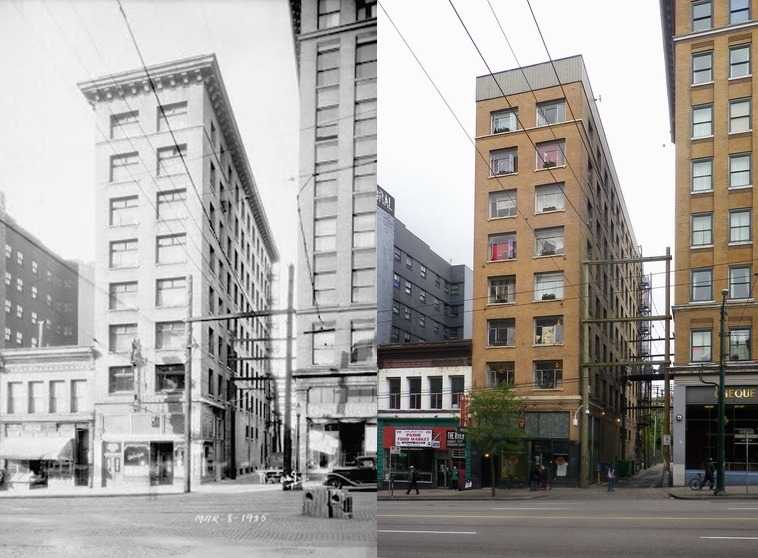 The Maple Hotel was built in 1912 by James Borland – the same man who developed 1090 Granville Street in the same year. In 1909 James was listed in the city’s Directory as a builder and contractor. 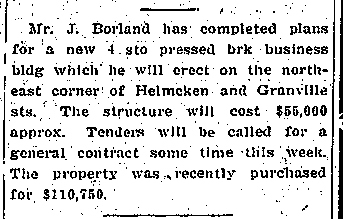 Peter Trousdale was a clerk with William Holden, (presumably the same William Holden responsible for the Holden Block) but a year later (and in 1911) the newly formed partnership of Borland and Trousdale were at 108 E Hastings. From 1912 to 1921 they were based in Borland’s new building in suite 101. Parr and Fee obtained the building permit, but Fee had left the partnership just before the building was to be built and Parr’s new partnership with Mackenzie and Day supervised its construction. James Borland was listed in later years as a real estate broker, as was Peter Trousdale in the 1911 census. Trousdale, like Borland, was a Presbyterian, lived in the West End, and had arrived from Ontario. In the 1922 street directory, son Stanley Borland was listed as a law student living at the family home, 1934 Nelson Street, and Peter Trousdale was managing the building he developed, the Trousdale block on E23rd Avenue. In 1925 James Borland had moved to 1361 Minto Crescent, his son Stanley was a dairy manufacturer and in 1930 was running Borland Ice Cream on W 6th Avenue. James is listed as still being in the real estate business from 193 E Hastings. Peter Trousdale is a salesman for the Permanent Loan Company, although still living in his own development off Main Street. It’s not clear whether James sold the hotel, but in 1930 Mr and Mrs Johnson were running the hotel and from 1932 to 1934 L Facchin was managing. In 1935 the hotel was renamed as the Hastings Hotel. This was no doubt connected to the notoriety it collected the year earlier when local bootlegger and brothel keeper, Italian born Joe Celona was charged (and sentenced to prison the year after) for running a brothel on the fourth floor of the hotel. Local (and prosecuting counsel’s) disgust was greater because he supplied white girls to Chinese clients. (for more on Joe see the Past Tense blog entry). James Borland died in 1937 aged 72 and Peter Trousdale died in 1948, aged 76. These days the hotel is called the Washington hotel, and its 84 non-market units are managed by the Portland Hotel Society on behalf of BC Housing who acquired it in 1998. It’s part of a recent announcement of a $116 million program to improve and restore heritage features on 13 of BC Housing’s buildings. We’ve seen 1090 Granville before, off in the distance on the 1000 block of Granville Street. It was designed by Braunton and Leibert for James Borland, who started small, as an Ontario born plasterer, building two houses (still standing) in Strathcona in 1892. By 1901 he was identified in the census as a contractor and he had built a two storey commercial building on Westminster Avenue (also still standing, although much altered). He was living with his wife Sarah and children Alfred and Stanley. In 1902 Borland and Brown hired Parr and Fee to design a building on Hastings Street (which can be seen here), built by Baynes and Horie next door to BC Collateral. In 1904 he had a court fight to acquire a site from Joseph Coote – the site being wrongly identified on the receipt. He won, and acquired the site where the Dawson Building would be erected for $20,000. In 1911 he was mis-identified as Barland but was living with his wife, children and now a daughter, Gladys, and their Chinese domestic Chufat at 1934 Nelson Street (close to Stanley Park, in a rather well to do area of town). In 1912 he really pushed the boat out, hiring Bedford Davidson to build Parr and Fee’s design for the Maple Hotel (now the Washington Hotel) at a cost of $80,000, and also this Granville Street building designed by Braunton and Leibert which cost $55,000. We don’t often see how much the land cost, so it’s interesting to see it cost twice as much as the building cost to construct. Although built as retail space with rooms above, by 1920 the only occupant was the Standard Furniture Co. By 1933 when this picture was taken it had become the T Maher Furniture Co, who were still there in 1939, but gone in 1940. Today the building still has retail at the base, but it has returned to its intended residential use on the upper floors and since 1991 the McLaren Housing Society has provided low cost, supportive housing for persons with HIV & AIDS. Dr Simon Tunstall was born in Quebec, in 1852, qualified as a doctor at McGill University and moved to British Columbia in 1881. After practising in Lytton and Kamloops he moved to Vancouver in 1892 with his wife and family and seems to have gained a favourable reputation which would extend to international recognition; when the American Medical Association met in Boston in 1906 Dr Tunstall was identified in the Boston press as a ‘distinguished visitor’ of the Association, and he presided at the Canadian Medical Association meeting in Vancouver in 1904. 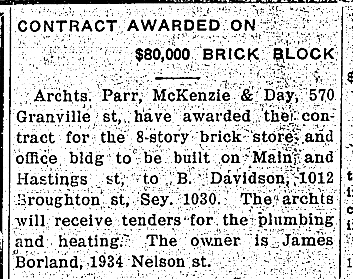 In March 1902 G W Grant obtained a building permit worth $1,600 to build the foundation for a building on Granville Street for Dr Tunstall, and two months later another permit worth $22,000 to build a ‘stone and brick store’ which was built by D Saul. This is almost certainly what’s shown in the image below; a three storey building on the north west corner of Dunsmuir and Gra nville. Vancouver Archives identify the date of the image as between 1913 and 1920, but in 1909 Dr Tunstall spent a further $20,000 on adding to the building, Dissette and Dean carrying out the work and Grant again designing the building, by this time in partnership with Henderson. The VPL image above from 1927 shows the completed building at five storeys. Dr Tunstall had Grant and Henderson design a house for him on 5th Avenue in 1911, and in 1912 they designed a $42,000 office building for him on Denman Street (although it doesn’t look like it was built). In the early years of its existence the Tunstall Block’s tenants were (not surprisingly) doctors, including a husband and wife chiropractic team. The building was replaced in the 1940s or 50s, and then replaced again by the northern block of the Pacific Centre Mall, designed by Zeidler Roberts Partnership and not completed until 1990. In 2007 the corner of the block had a radical redesign by Janson Goldstein of New York for the new Holt Renfrew store, incorporating panels of slumped glass in the design. We looked at this block previously, but here it is again quite a couple of years earlier before the Vancouver Block made its dramatic intervention. On the right of the picture, on the corner is 792-798 Granville Street. It was built in 1904 by J Rogers – almost certainly Jonathan Rogers, a developer and builder who developed the Rogers Building down the street a few years later. He hired T E Julian to design the building, and by 1906 it had tenants; Le Patourel and McRae, Druggists were at 792, the Sunset View apartments were upstairs and Joseph McTaggart, grocer was on the corner at 798. It’s likely that Mr McTaggart bought the building because in 1912 he got a permit worth $400 for repairs designed by Thomas Hooper. It’s not clear if he actually completed that work as in the same year the Royal Bank of Canada also hired Thomas Hooper to convert the building to a bank branch at a cost of $10,000, The Bank finally closed in 1961, and looked very similar then to 50 years before as this Walter E Frost shot from the Vancouver Archives shows. And that’s not the end of the story on this corner. The new Future Shop didn’t appear until 2003, but in the interim another Royal Bank building appeared, that lasted under 40 years. This 1980s City Engineers photo in the Vancouver archives shows it on the left, designed in uncompromisingly contemporary style by Underwood, McKinley, Cameron and Associates and completed in 1963. It’s unusual for us to have three (almost) lined up images, but here’s the east side of Granville Street around 1912 when the new and very impressive Vancouver Block had just been completed, looming over the much smaller two and three storey brick buildings. Faced in terra cotta, the Vancouver Block was designed by Parr and Fee for Dominic Burns who ran the BC arm of the family meat business established by his Alberta-based brother, Patrick. P. Burns & Co became western Canada’s largest meatpacking company and eventually Burns owned 700,000 acres of ranch land. Dominic looked after the British Columbia part of the business, and was wealthy enough to fund the $400,000 Vancouver Block in 1910 (with completion in 1912). Dominic moved to the top floor penthouse where he lived until 1933. In the same year the more ornate, and more expensive, Birk’s Block was completed just to the north on the same block, but that was lost in the mid 1970s to make way for the Vancouver Centre. Both buildings had a large number of small companies operating from the building. In the Vancouver Block there were as many as 17 different businesses on one floor. The rest of the block included the Windsor Hotel (later called the Castle Hotel) and the New Orpheum Cafe and Grill, while the building on the corner of Robson was for many years the Royal Bank. In 2003 a new 3-storey retail store designed by Studio One Architecture was completed, with a top floor Winners store and a Future Shop below it, and a number of smaller retail units on the Granville Street level. The middle picture shows the old version of the transit mall soon after the new retail block was completed; the newly designed street has vertical white low-energy lighting, and at this point in the street the street trees were not replaced.